Renato Meziat, a Brazilian painter whose still lifes are so realistic viewers reach out to touch their fruit and other objects, will open his first one-person exhibition at ArtSpace/Virginia Miller Galleries on Friday, Nov. 2nd. notes Virginia Miller, owner and director of greater Miami’s longest-established contemporary fine art gallery. Latin American realists as Claudio Bravo of Chile, Miller says. 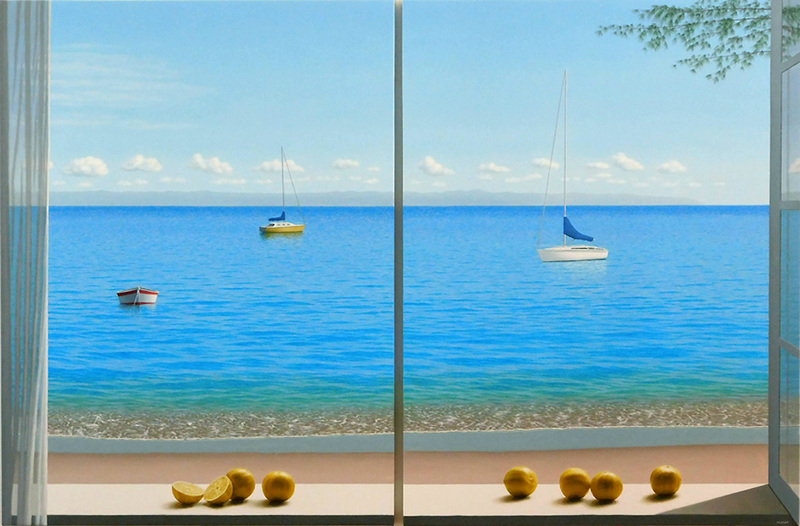 Along with still lifes, the artist’s favorite subjects include “windows” with thin curtains framing scenes of beaches and the ocean. His figurative works often feature female models in outdoor attire. Meziat first came to the United States in the 1970s to study music at Berklee College of Music in Boston. Back home in Brazil, where his father painted on weekends as a hobby, Meziat began to experiment with his father’s brushes and paints and realized he had a natural aptitude as a visual artist. Shifting his focus from music to painting, Meziat began years of self-study, reaching back to such great Spanish realists as Diego Velázquez. Eventually his study and painting resulted in his mastery of the medium. Among other prestigious venues, his work has been auctioned at both Sotheby’s and Christie’s in New York City. Several works by Meziat are featured in the current exhibition, “Eccentric Visions,” at ArtSpace/Virginia Miller Galleries in Coral Gables. Those works and a number of his other paintings may be seen here. Meziat has exhibited in such other leading venues as the Museum of Modern Art in Rio de Janeiro, Hammer Galleries in New York City, and art fairs in Chicago, Houston, and Palm Beach. The opening reception for “A Decade of Realism, Paintings by Renato Meziat” will take place from 6 to 10 p.m. on Friday, Nov. 2, 2018 at ArtSpace/Virginia Miller Galleries, 169 Madeira Ave. in the Coral Gables restaurant and business district. The exhibition continues until Feb. 22, 2019. For more information, call 305-444-4493.